Sensitive and selective electrochemical method for the determination of dopamine using a sodium dodecyl sulphate/polyglycine/phthalamide/carbon paste electrode was developed. 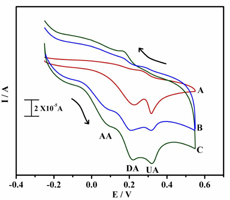 The sodium dodecyl sulphate/polyglycine/phthalamide/carbon paste electrode showed excellent electrocatalytic activity towards the oxidation of dopamine in phosphate buffer solution (pH 7.0). Electrochemical parameters such as the heterogeneous rate constant (ks) and detection limit (LOD) were calculated in phosphate buffer solutions at pH 7.0. The interference studies showed that the modified electrode exhibited excellent selectivity in the presence of large excess of ascorbic acid and uric acid. The separation of the oxidation peak potentials for dopamine–ascorbic acid and dopamine–uric acid were found to be 207 mV and 121 mV, respectively. The differences remained large enough to determine ascorbic acid, dopamine and uric acid both individually and simultaneously using cyclic voltammetry and differential pulse voltammetry techniques.